This is part 1 of a two part blog series about EMI / RFI gaskets offered by Stockwell Elastomerics and to help give a better understanding of options available to engineers tasked with EMI gasket design. Most EMI gaskets manufactured by Stockwell Elastomerics serve several functions; the first is to shield EMI emissions, the second is to protect a device from being interfered with by external emission (often referred to as susceptibility). Lastly, Stockwell EMI gaskets also serve as an environmental seal, protecting electronics from water damage from splashing, washing or rain. What is an EMI Combination Gasket? 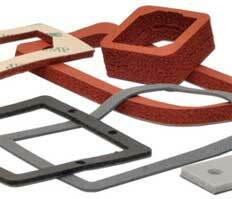 Combination EMI gaskets combine a traditional closed cell sponge gasket with a knitted wire mesh cord. The gasket material most often specified is silicone sponge because of its long life, weather resistance, and functional temperature range. The knitted wire mesh cord is most often made from Monel, a metal alloy that has very good corrosion resistance. Additionally the wire mesh is bonded to the “dry” edge of the gasket, which means it’s protected from water and fluids, this greatly minimizes corrosion. There are variations on these material options when specific properties are needed; as an example Stockwell Elastomerics offers fluorosilicone sponge that has better chemical/fuel resistance over un-fluorinated silicone. Fluorosilicone is often specified for aerospace applications where fuel exposure is a concern. Why use a Combination EMI gasket over a filled EMI gasket? Combination EMI vs. filled EMI gasket is a common question – while they are both used to manage EMI their physical characteristics are very different. Combination EMI gaskets are often thick (0.125” & 0.25”) as compared to a particle filled EMI gasket, they are also softer. This thicker / softer combination allows for lower clamp force and wider tolerances between sealing faces. This is advantageous for large EMI gaskets and enclosures made of sheet metal. Combination EMI gaskets are often used for NEMA enclosures with added EMI attenuation. Particle filled silicones and fluorosilicones are the most common “filled EMI” gasket materials. These are very good for EMI attenuation and sealing water, capable of sealing to IP66 and IP67. Filled materials tend to be harder and thinner; this requires a more rigorous bolt pattern and tighter tolerance sealing faces. 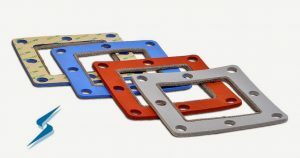 Stockwell Elastomerics manufactures both, combination and filled EMI / RFI gaskets, their Applications Engineers can assist in selecting which type is the best fit for your design. Stockwell Elastomerics manufactures their EMI gaskets in the USA at their Philadelphia, PA location and ship globally to OEMs and contract manufacturers. For more information regarding the above products or other EMI gaskets offered by Stockwell Elastomerics, please call 1-800-523-0123 or email service@stockwell.com.